Instead of £109.00. You save £5.45 due to the online discount . Do you regularly load and unload vans, relying on hand carts, trolleys or other wheeled transport equipment? Then you should always keep a pair of aluminium loading rails in the back of your van. The sturdy, narrow loading ramps are extremely space-saving. When loading, simply put them in place with the support tongue on the van and then comfortably push your transport equipment up to the loading area and down again. This enables you to work efficiently and less strenuously. The BASIC loading rails are made from robust, weather-resistant aluminium, which is especially non-slip due to its perforated surface. This means that the loading ramp can be safely used in all weather conditions. The contact tongue at the upper end of the aluminium rails allows for the quick and simple assembly of the rails, while the wedge profile at the lower end makes it easier to navigate the ramp. The aluminium loading rails can be used in many situations thanks to their maximum incline of 30% and a rail length of 200 mm. 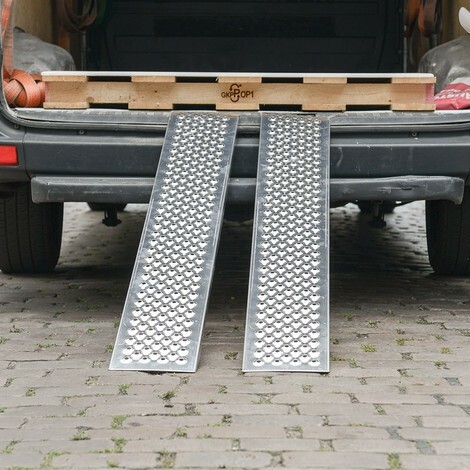 Order the helpful loading ramp for your vans from us here.